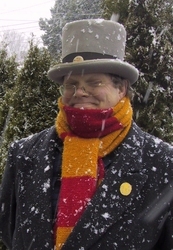 Phil Foglio won the Hugo Awards for Best Fan Artist (1977 & 1978) and Best Graphic Story (2009 & 2010) and is still waiting for the wealth and unlimited power he was told this would bring. In the meantime he has made a career as a writer and artist because he liked the idea of commuting fifty feet to his office. Over the years he has worked in the fields of science fiction, comics and gaming. His current project is the comic book series Girl Genius, which he works on with his wife, Kaja. His hobbies include travel, gardening and waiting.